Dr. Tsering Tsamchoe was born in Bylakuppe Tibetan Settlement in south India in 1977. In the year 1992, she joined Central University of Tibetan Studies, (CUTS), Varanasi and from year 1995 – 2002 she studied Tibetan Medicine at CUTS and has graduated as a Menpa Kachupa in the year 2002. After her graduation, she served as a Research associate in the Dictionary Unit, CUTS. 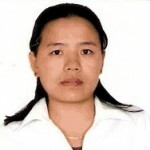 In the year 2007 till 2012 she served as a Research officer at Central Council of Tibetan Medicine (CCTM) and recently she was elected for the executive members of CCTM and currently serving as a General Secretary of CCTM.